Date/Time: Calculating and comparing durations? I have an Access import data file which contains three fields. A start date/time an end date/time and a Time Period. The Time Period is the duration between the start and the end. My task is to confirm the Time Period is correct. I have used the DateDiff function to calculate the difference between Start and End but it produces a decimal number. I have tried many different formulae and reformatting measures to compare the Time Period with my calcualtion but they all fail. Either Omniscope cannot parse the decimal or it doesn't recognise the time to convert it to text. I can easily paste the Time Period into Excel and reformat as a general number and it produces a decimal that compares favourably with my DateDiff but I need to do this in Omniscope. The default for the formula is to "day" so it might be decimals in terms of that. Tried using "hour" or "minute"? 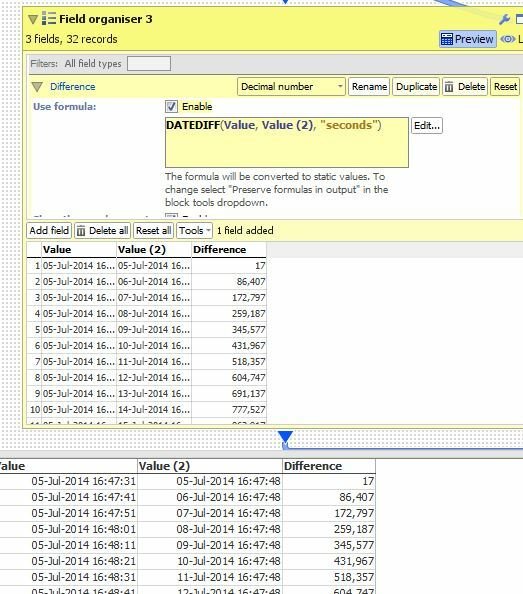 You shouldn't need to use the datevalue() if Omniscope is pulling in and converting those values into time (Check the Field manager on those columns). Formula will work on seconds/minutes/hours etc. please see the screenshot.